I am sorry to hear that it is your internet. I have been there before too. Hope they resolve the problem soon. i finally got my internet working late yesterday and am able to log onto my farms yay!! thanks ever so much for all your help Taz. I can't go from farm to farm when working for someone today . When I try I get what you see in the screen shot below. I clicked on go home and nothing happened. I have to click on play and reset the game to be able to get to my farm. I had everything turned off so only crops were showing. I did the usual maintanence cleared the cache etc before I began playing. I am having the same problem on my husbands account. He can't farm my place at all. at first it wouldn't even load my farm just got loggin but now he can go to my default farm but no where else. tried on my computer and same thing but I can go on his farm with no problems. Also others are farming my place and they are not experiencing this problem. Any Ideas I have already followed your instructions listed. Has he tried all the suggestions given in the first post of this thread including the links to server connectivity? Is he getting OK for all of them? When your husband arrives your farms, can he see all his neighbors photos in the neighbors bar? If not then the game is not completely loaded. He could click in Play till the photos are showed up. Also has he tried other browser to check if he has the same problem? he can see all the friends and he has same internet as I do and I have no problem visiting others.I tried all those and everything was ok even tried what Taz told someone else to do. Called my provider and asked if our server was receiving and they found no problems on their end our mine.It's just strange because we share everything. I even logged his account on my computer and it didn't work. Please tell your husband to try clearing his memcache (link below), then when the page of unsetting text opens he has to close it and his farm, then reopen and try to load your farm again. Also ask him to uncheck everything in his preferences before loading your farm. 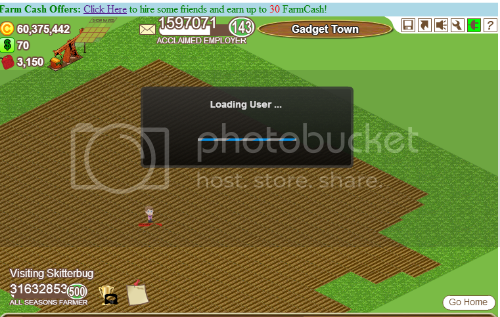 he did as you said now when he comes to my farm he has error message and has to reload the game. Thank you for all your help. My last try will be our internet provider but since it works just fine with me I doubt that's the problem. He had just started replaying the game because I did but now he says he remembered why he quit in the first place.